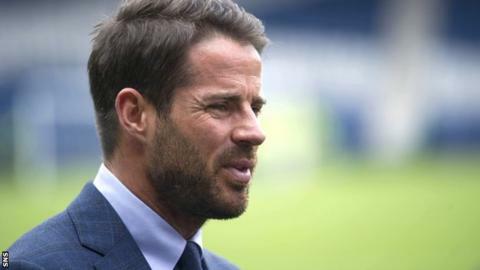 Former Liverpool midfielder Jamie Redknapp believes Celtic boss Brendan Rodgers will be a target for top-four clubs in England in a few years' time. The 44-year-old has followed the fortunes of the former Liverpool manager and has been hugely impressed. Redknapp stressed that Rodgers will be in no rush to leave "one of the best clubs in the world". But, when asked if England's top clubs may come calling, he said: "Without a shadow of a doubt, he ticks every box." Since moving to Celtic in the summer of 2016, Rodgers has yet to suffer a domestic defeat, having won all three trophies in Scotland last season. He has also guided Celtic to the Champions League group stage in both seasons and Redknapp believes Arsenal will be one of the clubs keeping tabs on the Northern Irishman. "If you are a player, and I played at the top level, I'd have loved to play for someone like Brendan Rodgers," he said. "He's the type of guy that looks you in the eye, he's very confident and he makes you believe in yourself. That's what you want from any manager - and tactically he knows the game. "At Liverpool, he was harshly done-by, but these things happen and, once you start to get a few bad results, the crowd maybe start to go against you. "That's football, but it doesn't make Brendan Rodgers a bad manager. He's turned it around and shown everybody how good he is. "I don't know what Brendan Rodgers thinks and he's managing one of the best clubs in the world. I don't necessarily think he's going to be looking to go any time soon, but if an opportunity comes in a couple of years, maybe that might happen. "At the moment, I'm sure he's happy winning trophies at Celtic and now, with Rangers back in the big league as well, it makes it a lot more interesting when they are going head to head. At the moment, Celtic are, of course, the team to beat. "If you're Arsenal in a few years, once Arsene Wenger decides to retire, if he ever does, I'm sure he'll be on their radar. "I hope the Celtic fans don't have a go at me for that, but he's that good a manager." Redknapp revealed he had been to Celtic Park a few times to watch Rodgers' side and said: "I love the way he has them playing." While the 44-year-old acknowledges that success in Scotland does not carry the same significance with many English observers, he believes Rodgers has qualities that set him apart from many of his contemporaries. "It's not as good as the Premier League, but I always judge a manager on whether he can improve players and I look at Celtic's team and see a vast improvement in a lot of their players," he added. "They've always had good talent there, but he takes them to the next level. "The coaching and good man-management skills, he's up there with the best. "Celtic have done so well. Of course, sometimes it's not, at times, a challenge like the Premier League, but you can only beat what's in front of you and Celtic do that. I'm a big fan of Brendan's."